Kylie Jenner has always been an avid supporter of brother-in-law Kanye West, and on Wednesday afternoon, she continued to show some brotherly love and attended the Yeezy Season 4 show in New York. Her attendance wasn't her only show of support though. Kylie Jenner's Yeezy Season 4 outfit was so totally on brand with Yeezy that it's actually amazing that she didn't walk in the show itself. In neurtrals — of course — and an oversized zip hoodie — because, duh — she was totally representing the Yeezy aesthetic to a T.
Jenner rocked a camel-toned terrycloth crop top with a mock turtleneck and no sleeves. Paired with the belly-baring top was a pair of very 1975-style terrycloth, high-waisted short shorts in the same shade. Basically, it was all neutral everything, even down to the clear pumps she wore it with. To literally top off the outfit, Jenner layered an oversized zip hoodie in a military green color that hung off one of her exposed shoulders. Basically, her entire outfit was screaming, "I love Yeezy," as it should. While the outfit was definitely a more pared-down look than her insane Balmain x Yeezy creation from Season 3, it was just as on brand as ever. Jenner took to the show with sisters Kim Kardashian and Kendall Jenner and beau Tyga. 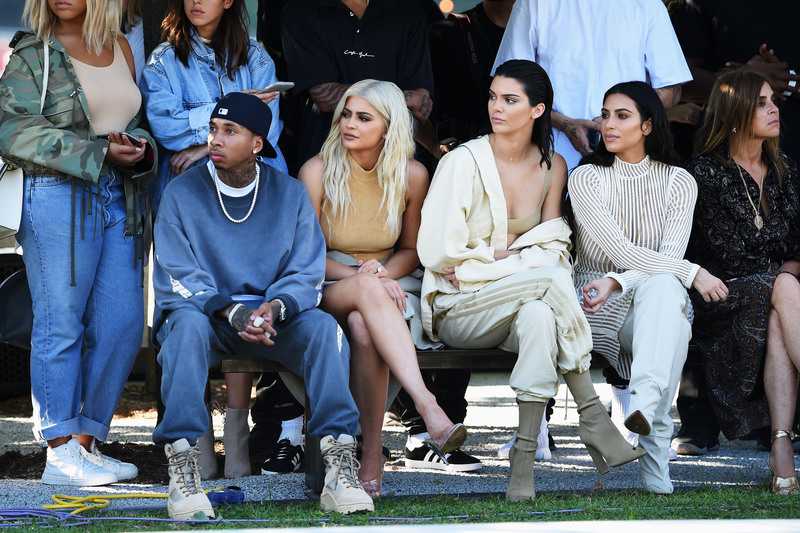 While Tyga seemed to be wearing Yeezy boots, the three women were at the Yeezy Season 4 show rocking coordinated neutral ensembles like bosses. The group basically looked like the baddest squad that you love but also kind of love to hate sometimes. Whether Kylie Jenner's Yeezy Season 4 ensemble will actually be a part of the collection or was created specifically for Jenner is still unknown at this point, it's clear that she was there to support her brother. Who doesn't love a family that sticks together?